At its heart, SideEQ is based on collaboration: Collaboration between the LRG and patients, between patients themselves (both within and across diseases), and between patients and researchers. All of these groups have one thing in common – the desire to improve the quality of life of patients. SideEQ does this in two ways – by allowing patients to have a place to track their medications and side effects, and by giving them access to information (both from healthcare professionals and other patients) that allows them to manage these side effects. When patients are able to manage their side effects, they can take control of their disease, stay on their medication, and have improved outcomes. 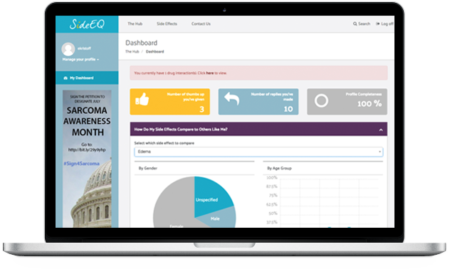 An important core function of SideEQ is its ability to measure the impact of side effects on patient adherence. Why do patients need SideEQ? In this era of “personalized” or “precision” medicine, doctors want the ability to target treatments specifically to the needs of the patient to improve outcomes. This often means tailoring treatments to a specific mutation, but in reality, it’s much more than that. True “personalized” medicine involves listening to the patient and trying whenever possible to match their treatment regimen to their lives. This includes addressing any specific side effects they may have and giving them strategies to overcome or minimize them in order for them to go about their daily routine. Unfortunately, this is difficult to accomplish when physicians see a multitude of patients per day. Often, they have only a few minutes to talk to the patient and many questions to answer, and don’t have time to address issues like side effects. Thus, the burden of side effects management is shifted to patients and their caregivers. SideEQ helps to shoulder this burden in three ways: first, by giving access to best practices for specific side effects; second, by allowing patients and caregivers to post their tips (as well as read previously posted tips) on how they control their side effects; and finally, by allowing patients and caregivers to enter not only the side effects they are currently experiencing, but also their disease and any medications they may be taking for it. This allows them to see statistics for each side effect specific to their disease and medication, letting them know how rare it may or may not be. SideEQ was designed for patients who suffer from different diseases including, but not limited to, GIST so as to help as many people as possible. The LRG has been reaching out to various patient groups to help them introduce SideEQ to their patients and has already been successful in collaboating with the National Leiomyosarcoma Foundation. We are happy to collaborate with new organizations and will continue to do so. Why do researchers need SideEQ? Understanding the impact of disease and treatment on the quality of life of patients has always been important, but has been difficult to measure. Patients rarely get to discuss their side effects with physicians, and if they are part of a study, this information often gets left out. Because of this, researchers get an incomplete picture of what the treatment journey is really like. When side effect and quality of life information can be collected from a wide variety and large number of patients, this helps sharpen that picture. SideEQ was designed to do just that. Data on side effects and treatments is de-identified and then aggregated, giving it the ability to be shared with researchers so they can better understand how patients treat their side effects, and ultimately the effect those behaviors can have on patient outcomes. The research industry is just now learning what patients have known instinctively for a very long time – that information provided by patients can in fact be very useful, and in some cases, as with side effects, can complement clinical data. This is often termed “real world evidence” and is a big focus in research and regulatory circles right now, as it is seen by many as the “missing piece” that will ultimately lead to better drugs and improved outcomes. Simply put, SideEQ helps supply that missing piece, and we’re very happy to collaborate with researchers to help make that happen. While SideEQ has already been quite successful with a few hundred users and over 20 diseases represented, our intention is to grow and improve even further. We will continue to reach out to patient groups in an effort to introduce it to as many patients as possible. We have also spoken with researchers, regulators, and industry leaders to help ensure that we are able to provide the type of data that is most needed. We are also continuously improving the product itself, with new enhancements already in development, and will continue to provide updates. Sign up for SideEQ – www.mysideeq.org. After a quick and easy registration, go ahead and fill out your profile and take a look around!